Murder to Measure prides itself on writing scenarios that can be solved if observed carefully. Even in our most outrageous events the clues are there - it's just a case of sifting the red from the herrings. I'm not giving away all of our secrets here, but if you read on you'll be well on the way to cracking your first case. 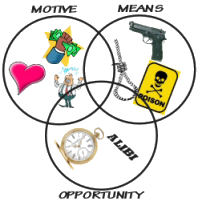 For a crime to be, er, executed, the murderer will need means, motive and opportunity. If you consider the suspects then many of them can be ruled out of being the murderer, because they lack one or more of these. Consider briefly each of these factors. Money - Would the suspect stand to gain an inheritance from the victim? How else could the suspect benefit financially from the death of the victim? Are they business rivals? Is the suspect being blackmailed? Love - lost love is a powerful motive - did the victim disappoint the suspect in matters of love? Is there an affair going on? Revenge - what has the victim done to harm or upset the suspect or his/her loved ones? Perhaps the victim is him or herself guilty of a previous crime, or they have thwarted the suspect on matters of love or money in the past. Means and opportunity are closely linked, but it is sometimes worth looking at them separately. Means is associated with the suspect having the equipment, specialist knowledge etc. to carry out the crime. Ask yourself how the crime was committed and then consider whether the suspects had the capability. Did they have access to poisons? Did they know how to fire a gun? Would they have the physical strength to overpower the victim? This is more associated with when and where the crime was committed. If a victim was stabbed and the suspect was verifiably miles away at the time, then they ain't guilty m'lud. Similarly if the crime needs some sort of premeditation and the suspect has only recently acquired a motive to kill the victim, they can often be ruled out. There may be other clues at the crime scene - a necklace, footprints etc, and these may help narrow down the list of suspects further. Observe all that you can. Of course, all of these factors are wrapped up inside a complex intrigue. Alibis can be faked, evidence can be planted and seemingly impossible feats can be performed by the most unlikely person - dreaming up such twists and turns is all part of the murder writer's job, otherwise everyone would solve the crime. But you're smarter than them, aren't you?